Last year around this time I spent a month in Koh Samui, one of Thailand’s many beautiful islands. Koh Samui is known as the coconut island and it truly does its name justice; there are coconut trees everywhere. That for me was of course the highlight of the trip. Few things make me as happy as being surrounded by coconut trees and trying new coconut dishes. Tourism and coconut export are Koh Samui’s main industries and that shows in the many faces of Thailand’s third biggest island. There are the touristy, party places entirely catered towards foreigners, the local Thai areas and there is nature. A lot of it and it’s stunningly beautiful. We stayed a month on a remote mountain top, surrounded by palm trees and lush jungle, overlooking the ocean. Pure beauty, everywhere you’d look. Besides some guests in 2 other apartments that were spread out over the property, the couple that managed it and some staff, there was nobody. The ultimate natural green retreat. We rented a scooter from two Thai ladies in the nearest town and drove around the coconut island. There was so much fresh fruit in Koh Samui, not only at the markets, but also in the trees right under our apartment. A banana tree with the sweetest wild bananas with seeds, tamarind trees, papayas, mangoes, pineapples, mangosteens, coconuts and different kinds of new fruit that I tasted for the first time in my life. Before we came to Thailand, we were too early for mango season in Taiwan and too late for it in Bali. We got lucky in Thailand and must have tried at least ten types of mangoes there which were truly amazing. Our mornings started with an early rise and a big fruit salad for breakfast. We’d then drive to the beach while the sun wasn’t at its hottest yet. We were far from the touristy beaches and right before high season, so we had some of the most amazing beaches all for ourselves. We went for a swim, took a mud bath, another swim, collected some coconuts and drove back to town to eat. Food-wise Thailand has some really great dishes, but with a vegan or vegetarian diet you have to get creative, especially outside of the touristy places. Luckily we found a great local vegan food place, with surprisingly only Thai people eating there. It was run by a very friendly Thai couple whose English was limited to ‘’spicy’’, ’’not spicy’’ ,’’thank you’’ and a very enthusiastic ‘’bye-byeee’’ which was probably equivalent to our level of Thai. We ended up eating there a few times a week and usually also did take-away for later. Food there was amazing, although most of it way too spicy even for my spicy-loving taste. What I enjoyed most food-wise on the coconut island were all the curries. Green curry, red curry, coconut mushroom curry, massoman curry..
Freshly prepared on the spot, often right in front of you. We visited many local markets and restaurants trying out different curries and most of them were amazing. Thailand has many interesting coconut desserts – our favorite by far was coconut ice cream. Whenever we’d see the coconut ice-cream (wo)man, we’d get some. Sometimes they drove around or you could find them at a market. Each of them had their own variation; creamy, sweet, with interesting toppings, very coconutty, less coconutty..we tried as much as we could. 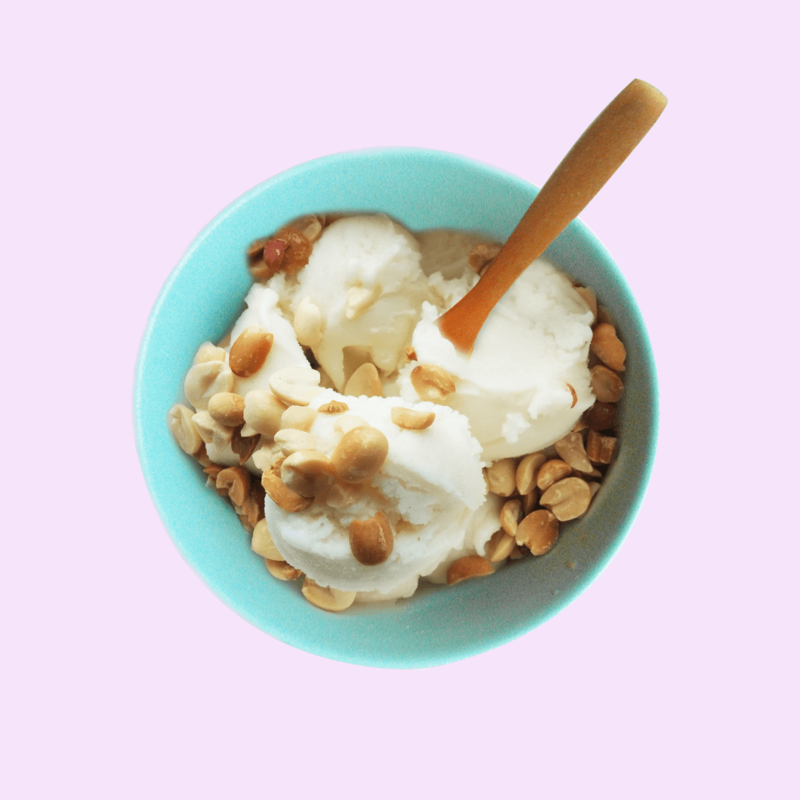 Here is the recipe for authentic homemade Thai coconut ice cream. Close to where we were staying was a small local coconut plantation with a sweet old lady, opening the coconut husks. 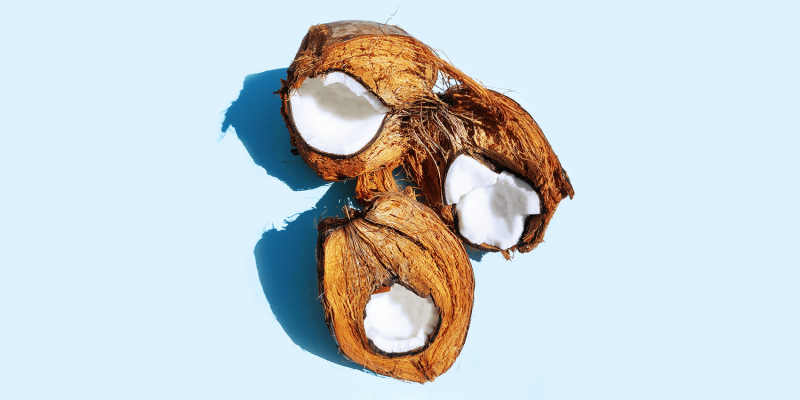 You’ve probably noticed that when you buy a coconut in the store, they’ve already removed the husk. They do this before they ship the coconuts, as it saves a lot of space and weight. You then just have to break the shell open to get to the coconut meat and water. 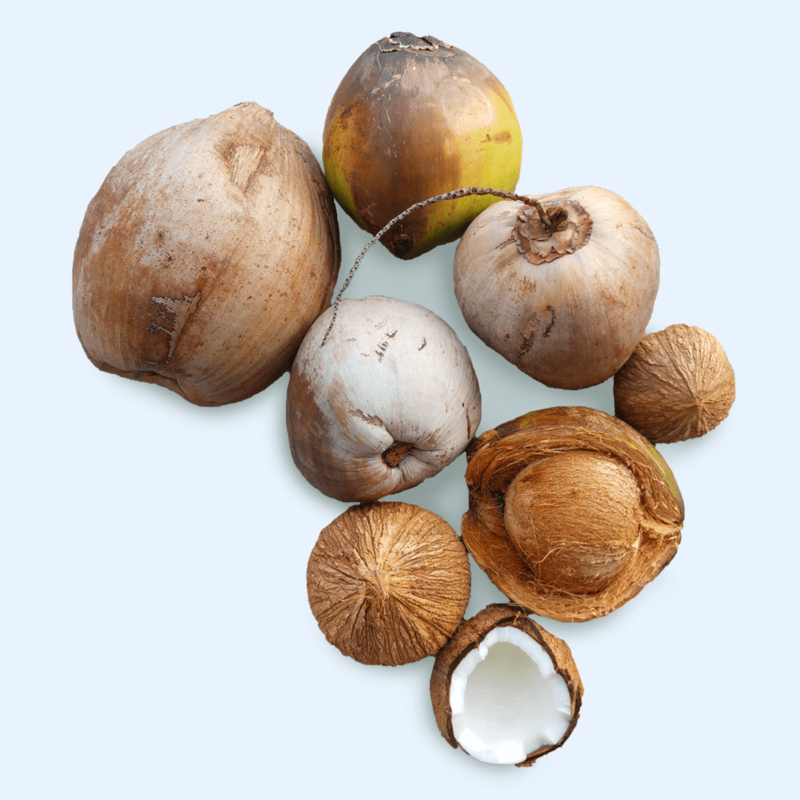 Fresh coconuts have a strong, thick husk that needs to be removed. It is so firm that you can throw it on the ground from the top of a tall palm tree and nothing will happen to it. This old lady was standing next to a metal blade cracking the coconuts open by hand one after the other. Any time of the day, any day of the week that we passed by, she was standing there cracking open coconuts which she then threw on a big pile of coconuts. It was very touching in a way. I would have liked to know how long she had been doing it for and if this was her plantation or if she was an employee. She didn’t speak a word English, so I never found out, but her coconuts were very tasty. Sometimes I wonder if she is still standing there opening coconuts. 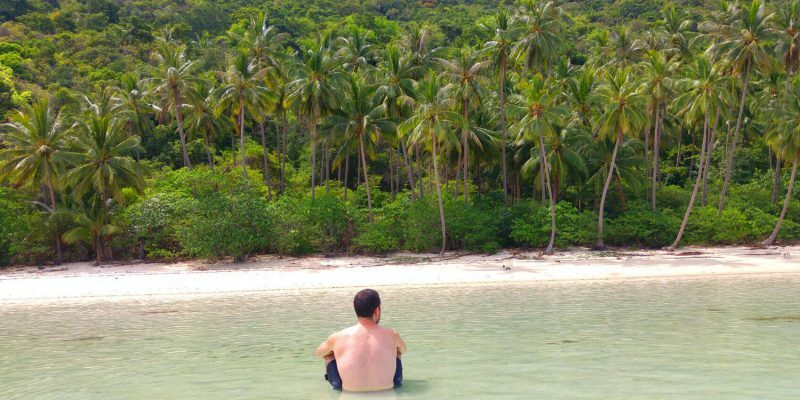 We loved it so much in Koh Samui that we decided to extend our stay on the coconut island and fly back to our friends in Malaysia two weeks later. I’m so grateful for being able to travel often and see so much of this beautiful world! The next coconut travel post will be about the Mexican Caribbean. Wow, beautiful views, I’d love to go to Thailand sometime. Brazil and Australia are on my list to visit. I also want to go back to Indonesia to see more of it, it’s such an amazing place. And Mexico has a special place in my heart..I lived there for a few years and love it!